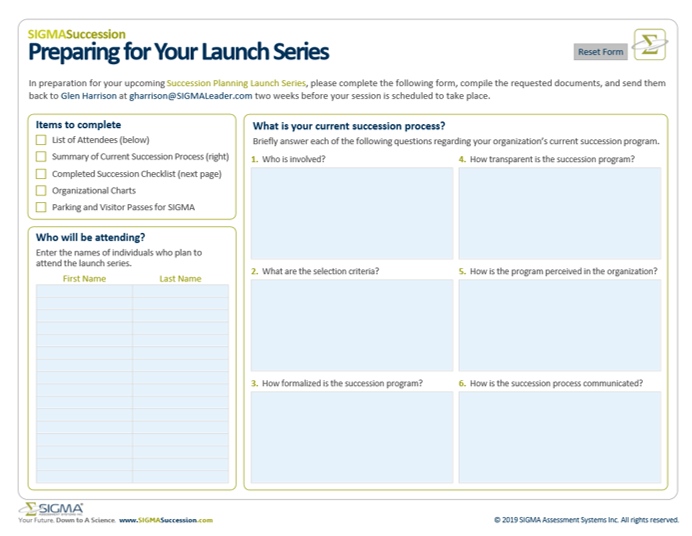 If you’ve signed up for the SIGMA Succession Launch Series, you’ve already taken the first step to having your own personalized Succession Implementation Plan. If you’re still unsure about how our Launch Series unfolds, check out our responses to our most frequently asked questions. 1. What should I do to prepare for my first session? We’ve created a helpful checklist that one member of your team should complete and return to your SIGMA succession consultant two weeks before your first Launch Series session. You can find the checklist here. The major components to note are (1) your organizational charts, (2) a list of who will be attending, and (3) an overview of your current succession process. 2. Who should attend the Launch Series? Choosing who will attend the Launch Series is an important decision. These sessions are most effective when decision-makers and leaders are in the room. This means you will likely want to include your senior management team. The number of attendees will likely depend on your organization’s size and structure. While there are no limits on how many people can attend, we typically recommend keeping your group to no more than 10. 3. The “Preparing for Your Launch Series” worksheet asks about my organization’s current succession process. How detailed should I be when answering these questions? The answers to these questions do not need to be highly detailed. However, we do ask that you take a few moments to answer them as best you can, consulting with others as appropriate. If the information isn’t easily available to you, that’s okay, just let us know in your response. Your may also wish to complete the “Is Your Succession Plan Set Up for Success?” checklist first to help get you thinking about your process before answering our questions. 4. How long will the session last? The Launch Series consists of two sessions, scheduled approximately 4 weeks apart. Each session will run for a half day, and can be booked to fit your schedule. 5. Can I combine the two sessions into one full-day workshop? The Launch Series is designed to introduce your leadership team to succession planning, gather information about your company’s current practices, and then later, to deliver a personalized Succession Plan. As such, the two-day format is necessary to gain the full benefits of the Launch Series. For more information on our other workshop offerings, contact us. 6. What will be expected of me during the Launch Series? During the session your succession consultant will walk your team through SIGMA’s six step succession planning process. We’ve built several exercises into the session to gather feedback from your team. We ask that you come to the session engaged and willing to share your thoughts and experiences. 7. Will I need to do any additional work after the session? No homework here! One of the advantages of SIGMA’s simple succession planning process is that all we ask of your team is their participation in our two half-day workshops. We do the work of gathering the information that was shared and compiling this into a customized Succession Plan for your organization. 8. What can I expect to get out of the Launch Series? After your Launch Series, your SIGMA succession consultant will prepare a customized Succession Plan for your organization that establishes the need for succession planning within your organization. This plan will also outline those positions with the most urgent need for succession planning, the impact of those roles on the overall business, and a bench of potential successors for each critical role, along with each candidate’s readiness and key development needs. We also provide resources for creating a development plan for each candidate, along with recommendations on how to measure progress. 9. My team has completed the Launch Series and received our custom Succession Plan from our SIGMA succession consultant. What’s our next step? Now that your organization has a comprehensive succession plan, the real work begins as your succession advisory team creates and executes development plans for each succession candidate, measures progress, and makes adjustments to the plan as needed. The Succession Plan compiled by your SIGMA succession consultant contains all the information your organization needs to move forward, but we know this isn’t easy. That’s why SIGMA also offers long-term consulting and project management for your custom Succession Plan. To learn more about these services, please contact your SIGMA succession consultant. 10. What other succession planning services does SIGMA offer? In addition to the Launch Series, SIGMA offers a host of succession planning services. Our experienced consultants can help you with the implementation of your succession plan, project management and on-call consulting, accountability workshops, long-term coaching, and more. We also offer succession planning focused workshops, webinars, and online templates to help you get the most from your succession planning process. Contact us to learn more about our offerings. If you still have any questions about the Launch Series or any of our other succession services, feel free to contact your SIGMA succession consultant, or lick here to email Glen Harrison, and we will be happy to help.